I said above ‘a spell in the 60’s’ and meant just that. The team won medals in everything until 1966 and then in 1967 they had dropped to sixteenth. Why was that? The answer is simply that in 1967 Law and District AAC was formed and there was an exodus from Motherwell – Andy and Alex Brown, Ian McCafferty and some others left with the result that the only real survivors in Motherwell were Bert McKay and Willie Marshall. Some seemed to disappear – David Simpson and Johnny Poulton are two that spring to mind. But let’s start here with David Simpson. DAVID SIMPSON was a quiet and friendly man. He was of medium height and wore leather heels on his running shoes that clicked and clacked as he ran – they often distracted other runners. He came from Shotts. By the time that Motherwell started their remarkable run of success in the 60’s he was a regular member of the squad and would get his only Scottish Cross-Country vest in 1962. It should be noted however that at that time there was only the one real international cross-country fixture and only eight men were picked annually, so if it were a good year for runners with many men at a high level, or if you were injured, then you had had it. I knew him best as a road runner. Like the rest here, I’ll start the story with the Edinburgh to Glasgow in 1960. The team was fourth and David ran the second stage, taking over from Bert McKay on the first. He held his eight place on this, the toughest stage in the race. In ’61 he was on the fourth leg and had the second fastest time with the team finishing third. ’62 saw him back on the second stage in the first winning MYMCA team. In 1963 Motherwell won again and David contributed by having the fastest time of the day on the fifth stage where he would represent the club three times in four years. A year later and he had the fastest time of the day on the fifth stage for the second consecutive year and again the team won. Motherwell tended at that time to keep men on the same stage for several years but in 1965 the switched several and not always with the happiest of results but David did his bit with the fastest time on the third stage in the team that finished second to Edinburgh University. In 1966, he was back on the fifth stage in the team that was third. Then the run of success stopped for reasons noted above. It was a shame. David had run in six races in the 60’s, turned in three fastest stage times and had one second fastest, and come away with 3 gold, 1 silver and 2 bronze medals. David was an excellent road runner with victories at several road races around Scotland – at one time the Gourock 14 miles seemed destined to be won by Motherwell men: David had at least two wins as did Andy Brown. He was almost ever present in their top relay teams in 1962 and 1963 with the regular quartet being Bert McKay, David Simpson, Alex Brown and Andy Brown who usually ran in that order. When John Linaker arrived on the scene David dropped from the top four for a while but, make no mistake, he was still a very good runner. The team was not quite as good on the country but David ran well. In 1959 he ran as a Junior for Shotts and finished fourteenth In 1961 however he finished eleventh in the Senior race to be third counter in Motherwell’s team that failed to close in six runners. In 1962 he moved up to ninth to be third counter in the team that was fifth and in 1964 he was eleventh in the bronze medal winning squad. In 1965 he was thirteenth and in 1966 he had slipped down to fiftieth: both times the team was fifth and out of the medals. On the track he had several rankings between 1960 and 1971. It should be remembered that at that time track running was almost all on cinders and that shoe technology was not as advanced as it is now. As for the marathon, hard trails were sought out: the Isle of Man was notoriously hard and the course from Westerlands in Glasgow was ferocious with several very testing hills. In 1960, David was ranked seventeenth with 31:34.2, in ’61 he was thirteenth with 30:55.0 and in 1963 he was twenty second with 31:12.6. In the marathon he was eighth in 1965 with 2:40.01. 53: Hugh Mitchell; 52 Pat McAtier; 138 Charlie McAlinden followed by Bobby Calderwood and Brian McAusland. If you had a picture in mind of a perfect running machine, WILLIE MARSHALL with his glasses and characteristic running action was not the one. But any team in the country would have been glad to have him: he consistently ran well and was a really valuable team member who was picked at times when more fashionable runners were not. In 1960 he ran the fifth stage of the E-G and pulled the team up from seventh to fifth. In 1961 when they won the bronze, he picked up from fifth to fourth on the same stage in the fourth fastest time of the day and in 1962 on the third, he pulled in no fewer than five places when he went from eleventh to sixth in the second fastest time in the team that won. In 1963, still on third, he was second fastest and moved from fifth to third in the winning team. ’64 still on the third, he maintained third place on the third stage for the winning team. In 1965 he was back to the fifth stage and again went home with gold. Switched back to three in 1966, in the team that finished third. Then the team disintegrated. He was as you might expect a regular member of the cross country squad and although the results available for 1963 and 1964 are incomplete we have enough to show that he was a hard working member of the team. In 1951 he was one hundred and first when the team finished fifth but although he picked up 22 places to seventy ninth the following year, he was a non-counter in the team that was fourth. In 1961 he was eighty sixth but Motherwell failed to finish a team that year. In 1962 he was fiftieth and the team was again fifth – although the results for 1964 are incomplete we know that Motherwell was third team and can reasonably assume that Willie picked up a bronze medal. In 1965 he was sixty third and in 1966, sixty fifth. An ever present in the National Championships. Like many of the MYMCA runners however, better on the road than the country. Willie was a very good runner who ran in many good teams and often enough stepped into the gap when some more illustrious runner was unavailable. 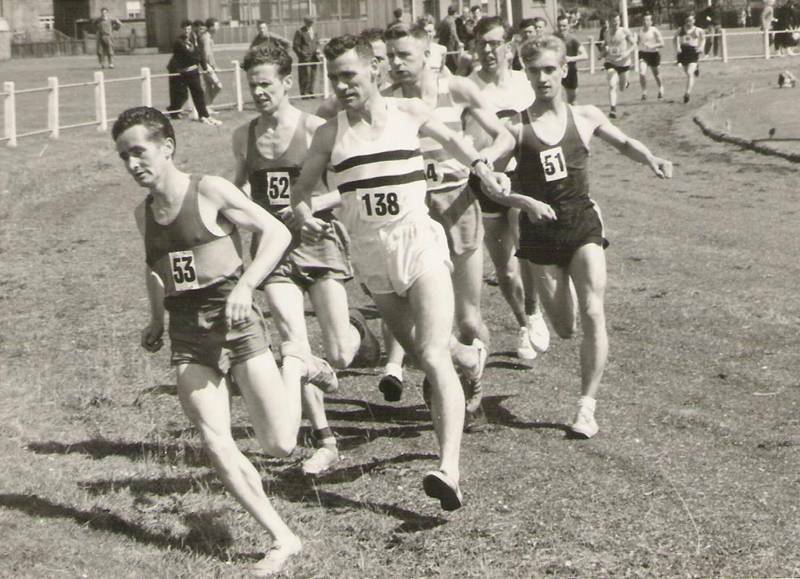 This was often at short notice as when, in 1966 Ian McCafferty just failed to show up for the McAndrew Relay – Willie was asked to step in and he did, running the first stage for the team that finished third; he turned oiut again the following week in the Lanarkshires and in the YMCA Championships with Bert McKay and the two Brown brothers. The minute McCafferty was back, Willie was happy to drop back to second team duty. Where many endurance men ran down on their feet and stood up at the end of the race, JOHN POULTON always ran tall with his chest out and head to the one side. His appearance was always immaculate – some runners are downright scruffy, and most are unremarkable from the point of view of their turnout but John always looked good and always looked just the same. Never apprehensive, never over confident, if the opposition was looking for confidence by looking at him before the race, they got no comfort at all. A regular in the Motherwell team from the late 1950’s until their demise in 1966, he had a good record in Scottish athletics. In the Edinburgh to Glasgow He ran the seventh stage in 1960 with the team fourth, the eighth in 1961 and, with the foursth fastest time of the day, assisted the club to third place medals. He was not in the team in 1963 but in 1964 he was third fastest on the eighth stage in the winning team and in 1965 when the team was second John was on the third stage. Back to the eighth stage in 1966, he pulled through from fourth to third and a medal winning place. Two golds, two silvers and two bronze medals in six runs in the 1960’s is good running. 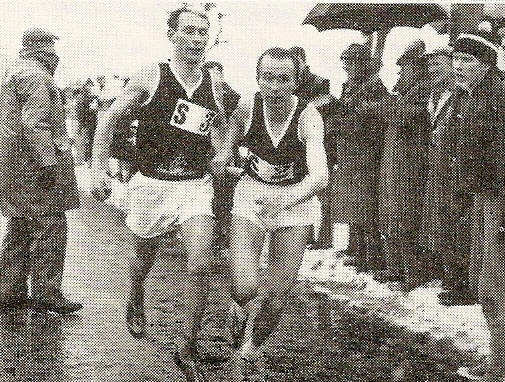 His country running was not as good or as frequent – he missed the National Championships on a couple of occasions and finished further down the field than might have been expected but in all the road events – E-G, Scally, McAndrew, GU Road Race, etc – he pulled his weight as a good clubman. John only appeared once in Scottish track rankings and that was in 1959 when his time in the 6 miles was 31:16.4 which ranked him twelfth. John also ran in several of the Two Mile track teams and indeed won several medals himself in the West District Championships. He was a very valuable clubman and the teams that did so much in the 1960’s could not have done it without him.